While Gazprom is the world’s largest natural gas exporter, it imports gas from Turkmenistan either for use in Russia or resale to Europe. Over the last year however, the amount Russia imports from Turkmenistan has plummeted. In 2008, Gazprom purchased more than 40 billion cubic meters of gas from Turkmenistan. By 2014 imports had fallen to around 11 bcm and in December 2014, Gazprom notified Turkmenistan that it would limit its purchase in 2015 to 4 bcm. Two weeks ago, Turkmengaz said that Gazprom had not paid for anything in 2015–though the amount (either in gas or cash) hasn’t been mentioned. The Turkmen Oil and Gas Ministry, according to a report by Russia’s TASS, attributed Gazprom’s payment problem to the “continued global economic crisis and economic sanctions imposed by Western countries against Russia.” Notably, the TASS report didn’t mention Russia’s announcement that it would only be importing 4 bcm from Turkmenistan this year. Forbes, which first broke the news Friday that Gazprom had filed a suit at the arbitration court, said that under the 2010 contract between Gazprom and Turkmengaz the price per 1,000 cubic meters was $240. According to RFE/RL last summer, using data from various European countries and statistics agencies, Gazprom’s prices across Europe are distinctly higher than the price it pays to Turkmengaz. Belarus, a close Russian partner, paid the least in 2013 at $166 per 1,000 cubic meters. Poland paid the most, at $526. As Russia’s relationship with Europe continues to fester over Ukraine, it also has looked for new partners. A May 2014 deal finally settled between Moscow and Beijing, worth $400 billion over a 30-year period, definitely got people talking about a Russo-Chinese alliance. RT reported at the time that under the deal, “Russia will supply China [with] 38 billion cubic meters of gas per year via the eastern ‘Power of Siberia’ pipeline, which crosses Siberia and reaches China’s populous northeast regions.” The pipeline isn’t planned to be up and running until 2018, but that date seems increasingly optimistic. Implementation was always going to be the difficult part–even after a decade of negotiations to even get to a deal. As Lilia Shevtsova of the Brookings Institution wrote recently, Beijing drove a hard bargain for Moscow: Russia is paying for the construction and China isn’t interested in paying as much as Europe, if and when the pipeline is completed. RT reported in June that construction had begun on the second pipeline agreed between the two, but commented that last year “CNPC refused to pay Gazprom a $25 billion advance for the pipeline construction. The advance payment could have helped China get a discount for its gas from Gazprom.” As it stands, China will be paying $350 per 1,000 cubic meters . Meanwhile, Turkmenistan already has a booming business with China. Annually China buys 30 bcm of gas from Turkmenistan and plans to double that by 2020. Incidentally, according to Bloomberg, China pays Turkmenistan $350 per 1,000 cubic meters–perhaps why the Chinese showed no interest in paying more for Russian gas. Not only was the Central Asia-China pipeline opened in late 2009, a second line was added in 2010 and a third began construction in 2012. Plus, the China National Petroleum Company spent money helping build the pipeline. Turkmenistan’s gas prospects continue to diversify, even if the infrastructure lags behind the politics. 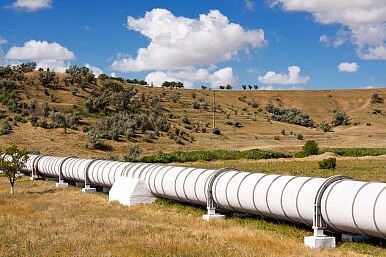 The country has one of the world’s largest gas reserves–there is plenty to go around if the right pipelines are built. With the opening of Iran increasingly possible (following a deal between the P5+1 and Iran on the latter’s nuclear program), and Asia’s growing demand for energy resources showing little sign of abating–Turkmenistan no longer needs the Russian market in the way it did a decade ago. Beyond China’s already dominant interest in Turkmen gas, Azerbaijan and Georgia have been courting Turkmenistan for partnerships to pipe gas under the Caspian and, they hope, on to Europe. Meanwhile, India has several pipeline dreams as well. As for the arbitration case, a Russian professor of international law, Dmitry Labin, was quoted by Ukraine Today as saying that “In most cases Stockholm arbitration takes a plaintiff’s side, if a defendant does not agree to revision of the pricing policy, despite the relevant clause in the contract.” But he went on to note that because Turkmnegaz is a state-owned company the Turkmen government may choose to ignore the ruling and extend immunity to the company. Still, taking the case to a court is an interesting move for Gazprom, and the dearth of details has analysts wondering what is going on behind the scenes. Turkmen gas exports to China fell from October to November, with sources indicating Ashgabat isn't pumping promised volumes.